Still no skill? Still no problem! Turn any spectator into a world-class card cheat. They'll love you for it unlike that stupid thing you do with the sponge balls. The magician hands the spectator a lucky rabbit's foot. They take turns cutting high card: the spectator wins every time. For the finale, they play a hand of poker - the spectator controlling the cards - again the spectator wins. 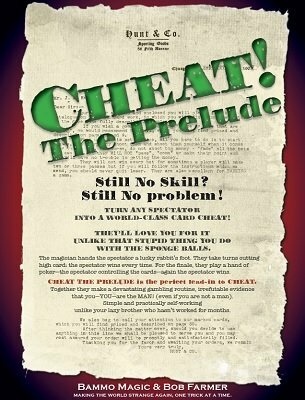 Cheat: The Prelude the perfect lead in to Cheat . Together they make a devastating gambling routine, irrefutable evidence that you - YOU - are the MAN! (even if you are not a man). Simple and practically self-working unlike your lazy brother who hasn't worked for months. Also included an Easter Egg. Nothing more to be said about this except it's a fooler. 1st edition 2018, 11 pages.